What a sweet little early chapter book! I'd put this at a challenging 2nd grade, easy 3rd grade level. Alice's family is so wonderful, so warm and charming. 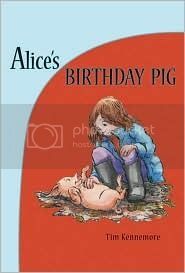 She's teased by her older brother Oliver for mispronouncing "aminal" After a class field trip to a small farm, Alice wishes more than anything for a real pet pig on her birthday. 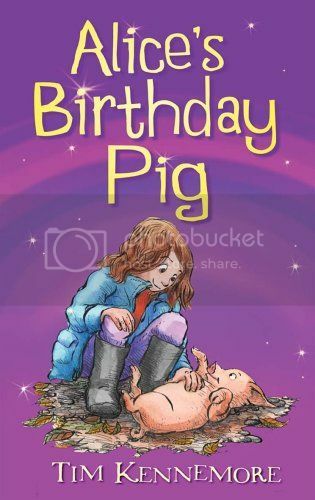 Her family has a delightful tradition of making elaborately decorated birthday cakes to commemorate an important event of that year for each child. In the past few years they've come up with a penguin, an airplane, a chutes and ladders cake, a train, a stegasorus, Big Bird, even a plain "cake, cake" for the year her brother complains about his cake not being grand enough. This year her parents make her a pig cake... and then surprise her with a pet guinea pig. Her little sister Rosie gets into Alice's gifts including a paint set and inadvertently covers Oliver with glitter but none of that matters. Alice names her new guinea pig "Aminal", much to Oliver's dismay. Alice and her family are the kind of people you want to get to know and hang out with. This story is a real winner.